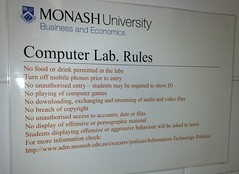 Recently I was amazed to read the current set of rules displayed in computer labs at Monash University's Faculty of Business and Economics. Included in the list is the following: "No downloading, exchanging and streaming of audio and video files". I await the day when our IT administrators accept the fact that "audio" and "video" are valid media for teaching and learning. The ignorant assumption that "multimedia equals illegal file sharing" has to be changed - quickly! @creative&meaningful: But there ARE rules that are excessively restrictive. How about a rule which prohibits us from "providing on a University website, links to other websites that directly offer copyright infringing material or direct users to copyright infringing material, including audio files such as MP3 recordings, video files, software or commercial photographs"? Have you EVER linked to a YouTube video, even if that actual video isn't in breach? That's so silly it simply would not be enforced, can you just imagine the reputational risk to the university if some nit tried?